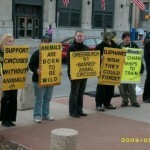 Ringling Circus is returning to Rochester, N.Y.
…and alas, ARAUNY will again be protesting Ringling’s ugly presence. 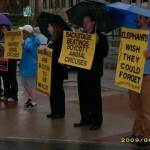 Participants in the Yellow Wall Ringling protest, 2009. Click to enlarge. – Stay on the sidewalk, usually close to the street (not in the building). – Please do not taunt those who are rude to us. Be courteous. 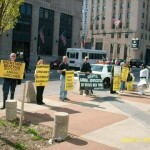 their day and are already there, but remember, the children are watching! Wear all black unless you are dressing in costume (e.g. clown, animal). This is a sad event. 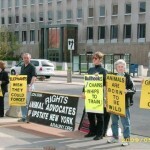 Signs and literature will be provided by Animal Rights Advocates of Upstate NY. You are also welcome to bring your own. 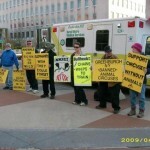 Please do not bring companion animals to the protest. 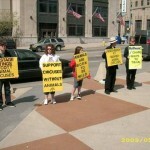 Advocate for the exploited and the enslaved.